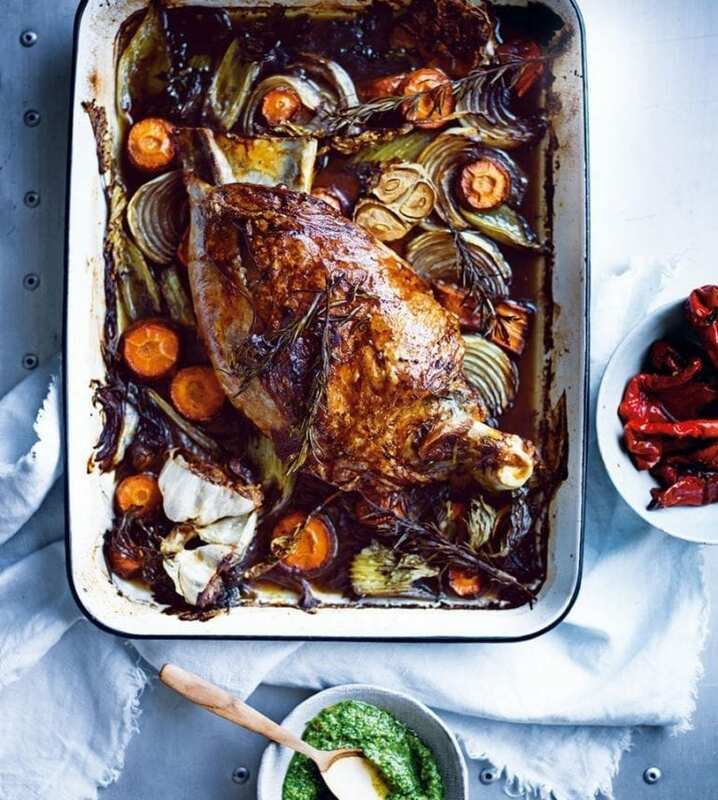 Our guide on lamb includes advice on how to buy it, all the different cuts and recipes to try. Britain’s earliest spring lamb is on sale just in time for Easter, but although this meat is tender, it does not necessarily have the best flavour. The animals are still very young, and have not yet spent enough time grazing on lush pasture for their meat to develop much flavour. British lamb is in its prime in early summer, and it continues to improve right the way through to the autumn, during which time the flavour develops as the animals get bigger and the joints increase in size. New Zealand has a similar climate to us and plenty of pasture, which means it produces very good lamb. And although it was once always frozen, regular air traffic means chilled fresh lamb is now readily available – and at its best in January, February and March, when British lamb is in short supply. The flavour of lamb improves immensely if it is hung – ideally for about a week. Lamb bones should be pink in colour. The rib bones from the middle of the carcass are good examples of this. Known to the butcher as ‘cherry ribs’, they are bright pink when the lamb is young. As the animal gets older, the bones lose their pinkness and become whiter. The colour of fresh lamb varies according to age and pasture. It should be bright, moist (but not overly wet) and brownish-pink (not too red or bloody). The fat should be firm, dry and slightly crumbly (not at all yellow). Don’t worry if there are any coloured stamps on the flesh – they are made using vegetable dyes and are completely harmless. Look for joints that are plump and nicely rounded with an almost dry skin, but not dried out or patchy from over-exposure. Salt-marsh lamb is one of the best known types, and is worth buying. Our best examples come from Wales or Romney Marsh in Kent, where the saltwater-washed pasture adds a distinctive sweet flavour to the meat. The animal can be divided into three: the fore end, the middle and the hind legs. Scrag end – the bony part of the neck, which is cut across into thick slices. It has lots of flavour and is best used for slow cooking. Middle neck or neck –similar to the scrag, this can be boned to produce lean neck fillets. Shoulder – sold whole or divided into two halves. It can be boned and either rolled into a neat roasting joint or diced for use in casseroles and curries. It also makes the best mince. The shin (i.e. the part lower down the front leg) can be removed from a whole shoulder. It is known as the fore shank and is ideal for braising. Best end of neck or neck best end – this consists of the first eight ribs of the animal, known as ‘the rack’. The meat and fat are usually trimmed away from the tops of the bones before cooking, and this is known as ‘French trimming’. A rack can be cut between the bones to give lamb cutlets. Loin – can be left as one joint: on the bone for roasting or boned and rolled into a joint, which is great for stuffing if some of the flank is still attached. It can also be cut between the bones into loin chops. Chump – this cut comes from where the loin meets the leg, and can be divided to produce two chump chops and a small, on-the-bone roasting joint called the chump end. Alternatively, the whole chump can be boned and sliced across into lamb steaks, or tied into a nice, plump little joint that is sometimes described on restaurant menus as the rump. Also ideal for stewing. Saddle of lamb –he loin from either side of the animal, still joined by the backbone. It weighs about 3kg and easily serves 8-10 people. Breast – the belly area of the lamb. Usually boned and rolled for roasting or pot-roasting. Leg – a whole leg of lamb weighs between 2.25-2.75kg and will feed eight people, but can also be divided into two smaller roasting joints: the knuckle end and the fillet end. Whole legs can also be sliced across, on or off the bone, into leg steaks for grilling. Legs can be boned and rolled into an easy-to-carve roasting joint. Butterflied – a ‘butterflied’ leg of lamb has simply been open-boned to leave one large piece of meat, shaped roughly like a butterfly. Lamb shanks – shanks are cut from the thinner end of the leg and are ideal for slow-cooking. Each serves one person.